Choosing your florist and flowers should be joyful and one of the most pleasurable things you will be planning for your special day. Every wedding is special and unique, so every consultation is done especially just for you. If we are not familiar with your chosen venue we will arrange a walk through to familiarize ourselves with the room dimensions, colors and any special considerations or concerns related to your venue. Weddings are all about sharing your love and joy with your family and friends. Bloomies believes that planning your flowers for this special day should be fun and just as wonderful. Every wedding; no matter how lavish or intimate, deserves special attention. 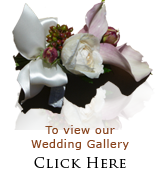 From the bridal bouquet to the reception, Bloomies will help you to realize your vision for your flowers. Every arrangement is created with you in mind, what your favorite flowers are, if you prefer scented or unscented flowers, what your color scheme is, or if you are having a themed wedding how we can incorporate it into the florals. Bloomies will set up an appointment for a consultation with you to discuss your vision for your wedding and help you plan how to make it a reality. Bring in magazine clippings, fabric samples, pictures of your dress, even pictures of things that you do not like, all information you bring will help to define and personalize your wedding style. Consultations take approximately 1-1.5 hours. Consultation fee of $150.00 includes initial consultation, written estimate, and if you engage Bloomies as your florist, the consultation fee will be credited to your balance.